The first in a series of imaginative children’s sweaters inspired by favorite animals, this froggy hoody is realistic enough for pretend, and practical enough for every day. Sizes from 3 months - 6T. It is shown here in a classic green and yellow combination, but the color possibilities are endless, as frogs come in so many different colors. 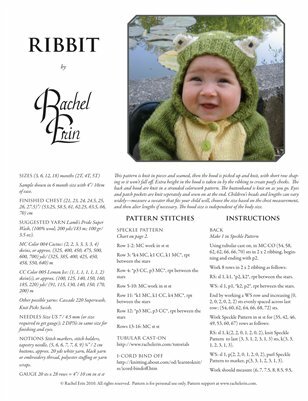 Ribbit is knit in pieces from the bottom up and seamed. After the body is seamed the hood is picked up and knit, with short row shaping. The buttonholes and button bands are knit as you go on each front. The simple stranded pattern is charted and written out. I-cord is used for a special finish at the neck and pocket edges. I provide tutorial links to the tubular cast-on and i-cord bind-off. The sweater is designed with 4”/10 cm of ease for room to play and grow.